is he Vor ? or just a fake wanting to be Vor? 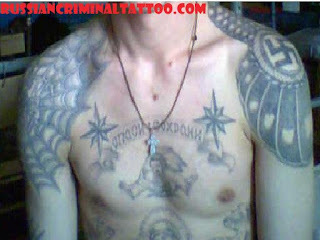 The epaulette of gang status is tattooed in or outside prison? What do the words in Russian mean on the banner between the stars? no,he is not vor,stars are on chest. haw in english this words(Spasi i sohrani)i don't know.